Just south of Cardiff lies the sleepy, seaside town of Penarth, which forms a nice stop off if you’re hiking the Wales Costal Path, or just want a slow-paced day out from Cardiff. There are plenty of nice eateries there, one of which is a pub that got a mention in this year’s Michelin Guide: The Pilot. Today, it’s a bright and breezy boozer, part of the Knife and Fork group (that also own The Conway in Pontcanna), and sports white, wooden panel walling, and nautical themed details dotted around the place. There’s a restaurant area, a lounge, and tables outside for those brief moments when the sun’s out. A few years ago, before it was taken over by The Knife and Fork I used to live just up the street from The Pilot, when it was a very different beast: full of surly locals, dark and dingy inside, and with the vague sniff of waccy baccy as you’d wander past, keys in hand (just in case, like). I only dared go in for a drink once, and it was the fastest pint I ever drank. Today the place couldn’t be more different: it’s friendly and welcoming, and the day I visited, it was full of “ladies doing lunch” (any TV execs reading this – you should immediately be preparing for the ‘Housewives of Penarth’, right? ), along with a couple of hikers and cyclists who had stopped for refuelling on their way. 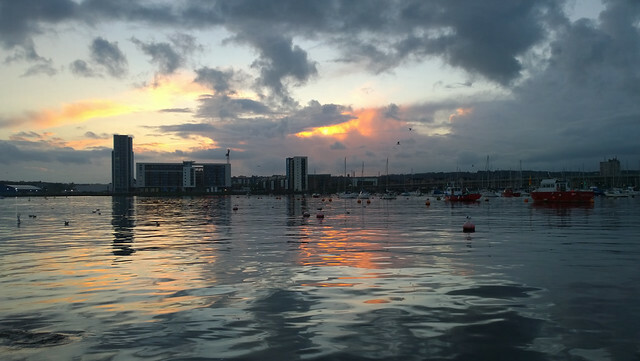 The restaurant area has a cosy wood burning stove and beautiful views over Cardiff Bay. What’s not to love? There’s a special lunch menu, which mostly consists of baguettes / sandwiches for around a fiver (perfect if you’re just stopping for something quick), or you can order from the main a la carte menu. There are also daily specials. As we weren’t in a rush, we went for three courses (sharing the starter and pudding). For a shared starter, we picked the squid and prawn with Asian slaw. Looks delicious, right? It really was. The squid was soft and tender, and the prawns grilled to perfection. For mains, there was a wide selection on the a la carte menu (salmon, lamb, and beef) but we picked the duo of pork and the beetroot risotto (obviously to eat sharesies). We also asked for a recommendation of wine to accompany the pork (I let my dining partner deal with this, as I’ve never been a wine drinker). The duo of pork was a big winner: particularly the belly pork, which was cooked to perfection (especially the crackling …). The risotto was a sweet main, with torn chunks of goat’s cheese to cut through the sweetness. Also some beetroot crisps on top. It was delicious (so if you’re a vegetarian, you’re in good hands in The Pilot!). I did wonder whether we’d manage to stuff in anything else after that, but obviously there’s always space for pudding, right? I was tempted by the Earl Grey creme brulee, but the bread and butter pudding was recommended so we picked that instead. I hadn’t eaten the old bnb since school (and didn’t have great memories of it from then), but it was light and fluffy, and served with some insanely good vanilla ice cream and chocolate sauce. If you can imagine me doing a Homer Simpson style face drool, that’s what happened here. We just about managed a couple of coffees before falling into a food coma. Luckily, The Pilot is right on the top of the hill on the northern edge of Penarth, overlooking the Bay and Cardiff beyond it. If you’ve got a healthy appetite, you’re in luck here: the portions are generous, the food is delicious, the service is friendly, and it’s a lovely location to while away some long hours in the afternoon. So if you’re on the Wales Coastal Path, just wandering vaguely across the Barrage, or looking for somewhere to get out of Cardiff, The Pilot comes highly recommended as a place for food or just drinks. They have a different ale on tap everyday, as they support a local Vale of Glamorgan brewery. They do plenty of offers that chance on a weekly basis (for more info, check @ThePilotPenarth Twitter feed). Steak Wednesdays? Six Nations burgers? Yes please! I had many a happy hour in the old Pilot when John Hickey was land lord it was a real good community pub and a good place to meet and chat.